Wow Bacon: Microwave crispy bacon in minutes without mess. Cook crispy bacon in minutes with the WowBacon Microwave Cooker. This ingenious broiler allows you to prepare six strips of crispy bacon without any splatter or mess. WowBacon's enclosed design ensures all drippings are contained and pooled for easy disposal. No more paper towels! The dishwasher-safe WowBacon Microwave Cooker allows you to make as much bacon as you want, on the spur of the moment, with set-it-and-forget-it ease. Perfect bacon in minutes without any mess! With the WowBacon Microwave Bacon Cooker, you can enjoy the amazing taste of freshly broiled bacon in a matter of minutes. And the best part is that clean-up is super easy! Here's the step-by-step process: #1. Load your bacon into the WowBacon. #2. Put the WowBacon into your microwave and wait a few minutes. #3. EAT THAT CRISPY BACON! The WowBacon Microwave Cooker makes it quick and easy to cook delicious bacon. 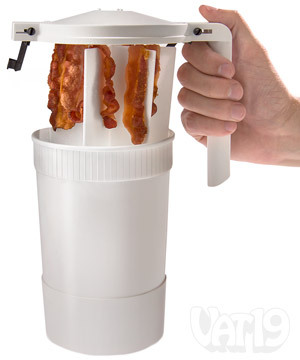 All of the grease that drips off your bacon is collected in the WowBacon cup. When you're done cooking, simply discard those drippings and toss the WowBacon in your dishwasher. 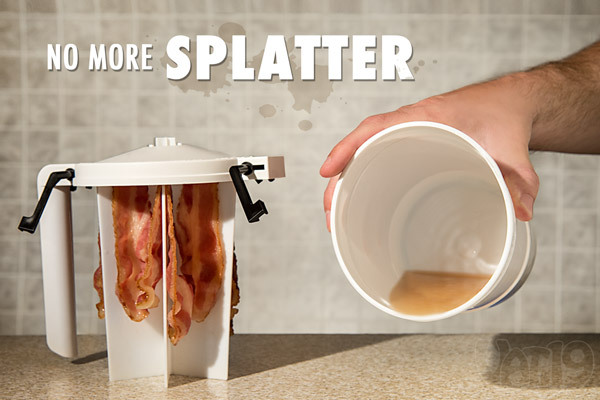 WowBacon collects those greasy drippings for easy disposal. The WowBacon Microwave Cooker allows you to broil up to six slices of bacon in a matter of minutes. You can cook an entire pound of bacon in about 12 minutes (depending on the power of your microwave). Here's how it works: Simply load the strips onto the vanes (the lid and handle separate for easy loading) and snap it on to the top of the WowBacon cup. Place it in your microwave for a few minutes and voilá, crispy bacon! 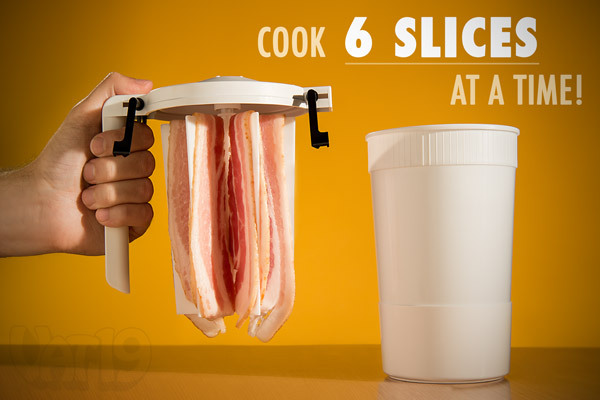 With the WowBacon, you can cook up to six tasty strips of bacon in a matter of minutes. America loves bacon. 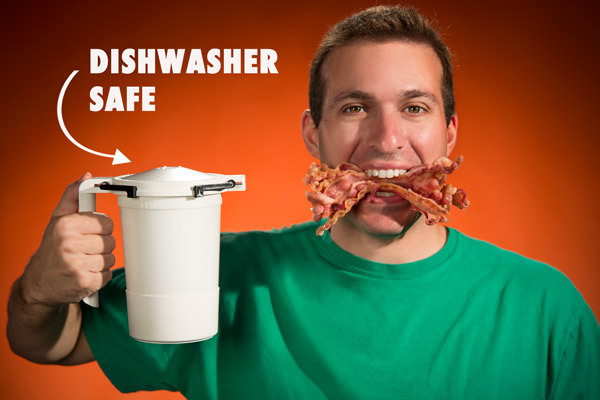 So, it should come as no surprise that the amazing and dishwasher safe WowBacon was conceived and designed in the USA. Yum! Look at all that amazingly crispy bacon! Question: I hate microwaved bacon. Will WowBacon make my bacon taste as good as my pan frying? Answer: That's a matter of preference, obviously. However, we are certain that bacon cooked in the WowBacon will be deliciously tasty, quick and easy to make, and simple to clean up. Question: Is there a bigger version for broiling more than 6 strips at a time? I need LOTS of bacon. Answer: Did you know that you can cook a pound of bacon with a single WowBacon in as little as 12 minutes? That being said, we understand the desire to do it jumbo. But a bigger version wouldn't necessarily be that convenient since it would take up more space. However, if five pounds per hour isn't fast enough for you, you could purchase more than one WowBacon (hint, hint!). Question: How long should I cook each strip? Answer: Pro tip #1 is to always set your microwave to maximum power. Vary the degree of cooking by the amount of time, not by the power setting. Now, to determine the correct cooking time, you need to multiply the number of strips you're cooking by 30 or 45 seconds (regular vs. thick cut). Finally, multiply this number by your power ratio. This is 1000 / your microwave power. So, if you have a 1200 watt oven, your power ratio is 1000/1200 or 0.83. If you have an 800 watt oven, your power ratio is 1000/800 or 1.25. Example: Assume you have a 1300 watt microwave oven and you wish to cook 5 strips of thick cut bacon. You would set the timer for 5 x 45 * (1000/1300) = 173 seconds (2 minutes 53 seconds). Question: What do I do about the thin strips of bacon at the start or end of a package? Do I need to run them separately to prevent overcooking? Answer: To fully answer this question, we have to break down how a microwave works. While an oven heats up the air surrounding your food, a microwave excites the water molecules inside your food. Eventually, the water exits in the form of steam and warms your delicious nourishment. There is a decent amount of water content within bacon fat. As water exits, liquid fat runs down the side of the bacon and collects at the bottom of the WowBacon cup. The water inside thinner strips will exit more quickly than thicker strips. However, continued microwaves won't "burn" the bacon as the microwave energy will have no water left to excite. In fact, its temperature will begin to drop a bit as the thicker strips continue to broil. Science, baby! 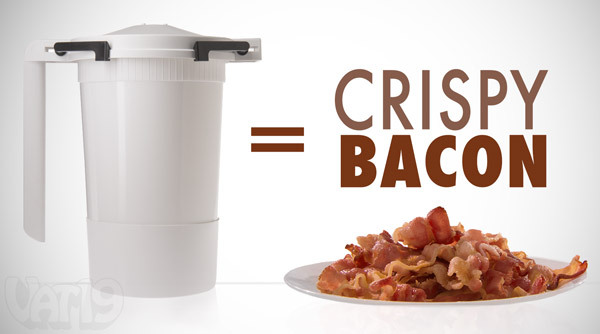 It's how we make bacon taste even better! Question: How do I clean WowBacon?